The Kinesis Pro GTX handled demanding terrain impressively, according to a satisfied expert. Its excellent ankle stability received high ratings from a small group of testers. Based on many consumer reviews, it was surprisingly comfortable. The lacing system that delivered a good fit received compliments from a great number of boot owners. Numerous buyers said that its ultra-expensive price was worth the purchase. Its construction was top-notch, as testified by countless wearers. Umpteen users testified to its effective waterproofing. The Kinesis Pro GTX is a heavy boot, according to a few experts and backpackers. Some male hikers mentioned that it needs a significant break-in time. A couple of outdoor gear bloggers mentioned that this backpacking boot runs narrow. The Scarpa Kinesis Pro GTX performance complemented its steep price. It surely earned a long list of commendable features. As declared, comfort, support, stability and quality build, were all packaged in this boot. To conclude, the Scarpa Kinesis Pro GTX is a good investment that can be beneficial to narrow-footed users. But the advantages only come after breaking it in. So this boot is a fantastic product for somebody that's looking for heavy-duty but still has a nice light weight to it and you could still do some very great firsts for hiking. I would highly recommend them to anyone who's got the money and is looking for a heavy-duty boot for anything from backpacking to, you know, some hunting way in the backcountry or whatever. Often used as a 4 season boot, this isn’t lightweight by any means but also offers the best durability and support. No matter the outdoor adventures, with these versatile boots you will well-prepared to handle all that you encounter. The Scarpa Kinesis Pro GTX is created ready for longer treks with heavy loads. It has a leather upper lined with Gore-Tex for protection. Addressing comfort are the Auto Fit Collar, Ankle Padding and Flex Point System. The sole unit of this backpacking boot includes a 2D PU midsole and a Vibram Biometric outsole. Scarpa designers included a dynamic TPU shank and an Activ Plus insole to optimize support and cushioning. 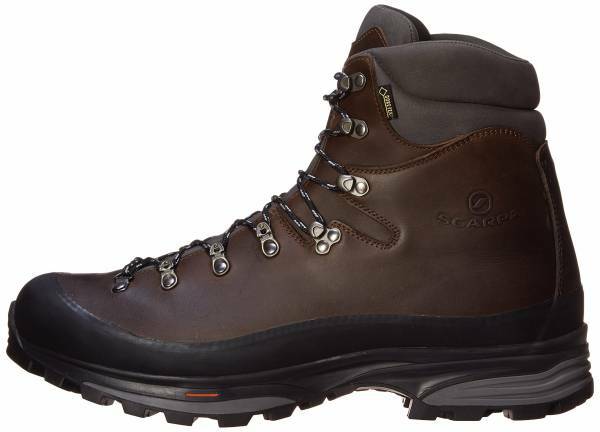 A men’s backpacking boot that fairly runs true to size, the Scarpa Kinesis Pro GTX comes in regular sizes and standard width. With the Activ Fit feature, it uses a BD last which renders more volume at the toe area and secure heel fit, yielding an enhanced comfort. Its lacing system brings a customized and precise fit. The Vibram Biometric, made of XS Trek compound, renders sensitivity on various ground surfaces. This rubber outsole promotes natural rolling motion of the foot while rendering stability. Its aggressive lugs and tread profile are self-cleaning for an enhanced grip on trails. The double density PU midsole takes care of underfoot cushioning. It also comes with a dynamic TPU shank that gives rigidity and stability. An Activ Plus insole made of polypropylene and 4.5 mm thick fiberglass adds support and comfort. Scarpa’s Activ Impact technology enhances shock absorbency and increases energy return. This characteristic results in a more efficient and comfortable ride. The Kinesis Pro GTX has a 2.4 - 2.6 mm full-grain calf leather reinforced with a full rubber rand, giving it a durable and robust upper. The Gore-Tex Performance Comfort lining renders insulation and protection against water. This high-cut backpacking boot features an ergonomic Auto Fit Collar and Ankle Padding System which adapts to the foot’s anatomy for enhanced comfort. Its Flex Point System, on the other hand, allows the ankle to move freely. The Speed Lacing, through its combination eyelets and straightforward closure, wraps the foot securely. This boot received the 2014 Gear of the Year recognition from the Backcountry Skiing Canada.